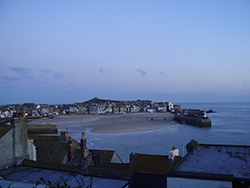 There is no doubt that St Ives is one of the most beautiful towns in Cornwall, if not in the whole of the UK. One of the things that makes it so special is the location. Because of the geography of the coastline the town is almost surrounded by the sea, with beaches on all sides. This is one reason for the town's reputation as an artists colony. Many talk about "the quality of light" and on certain days, when the weather is right this just has to be seen to be believed. 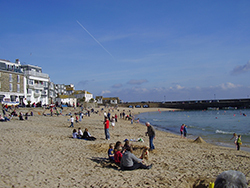 All of the beaches around the town and the local area meet clean water standards. Most have shops and snack bars or cafes. This is located on the eastern side of town. For some reason I always think of this as St Ives' "continental" beach. It has that feel to it and on a sunny day you could be in Spain or Greece. A long stretch of sand, with a small stream running through the middle which kids love to play around. There is a mini putting course just behind if you want something to do. Also the excellent Porthminster Cafè. Local Tip: If you want to eat at the cafe do book in advance. It is extremely popular, possibly because of the great views but mainly because of the food ! 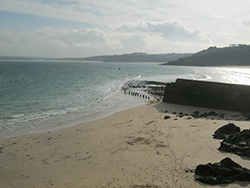 St Ives has a tidal harbour with the main sandy beach at the far end. This is very sheltered and is a great spot if you just want to chill out for a while. Also a great place for kids to play, as the water is quite shallow and there plenty of things to explore. Because this is close to the centre of town and the shops, this is a good place to come if you are a couple with children. One of you can watch over them while your partner goes of to explore the town. There are a number of cafes, restaurants and food outlets on the harbour front nearby.You can hire deckchairs during the main holiday season. Local Tip: Watch out for the seagulls, for some reason they're particularly aggressive around this part of town. If you continue past Harbour Beach, following the path along the waterfront, you'll reach the lovely sheltered cove that holds this beach. Because it is quite small and enclosed, this is a good place if you have small kids, it is easier to keep any eye on them and they have less chance to wander off. There is a great cafe where you can sit down for lunch or dinner, also a snack bar and shop. Local Tip: To save a bit of money, particularly if you have kids, buy your cold drinks and snacks at the Co-Op before coming down. This is my favourite, particularly at quiet times. I think this is one of the most beautiful locations I have ever seen anywhere. 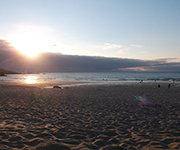 It is the town's biggest beach and faces north onto the Atlantic Ocean. Because of this it is very much the surfers beach and gets tremendous surf when the conditions are right. During the holiday season it is patrolled by lifeguards, who set up flags to show the safe areas for surfing, bodyboarding and swimming. The Surf School runs classes for all abilities and can provide all equipment needed. Overlooking the beach is Tate St Ives, fantastic architecture and (sometimes) great art. Local Tip: Come down here in the evening when most of the crowds have gone. 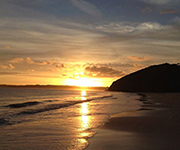 Bring a bottle of wine and a picnic, watch the sun go down over the headland. 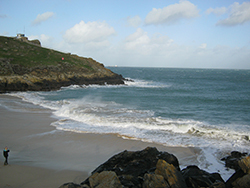 A small beach tucked away between St Ives Harbour and Porthgwidden Beach. To get there head to the end of the harbour - bear left at Smeaton's Pier then right through Wheal Dream. Continue past St Ives Museum and onto the path towards Porthgwidden. Bamaluz Beach can be accessed via a steep flight of steps on the right. The beach is completely covered at high tide so only accessible for parts of the day. The beach is dog-friendly at all times all year round. 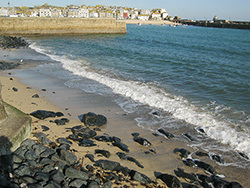 A small beach between St Ives Lifeboat House and St Ives Arts Club. 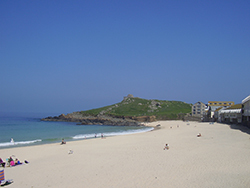 The best beach in St Ives for beachcombing. 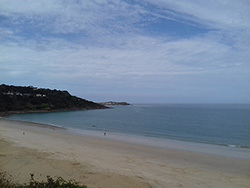 A pleasent walk along the South West Coastal Path will bring you to Carbis Bay Beach. A wide expanse of sand with lovely views across the bay back towards St Ives and across to Godrevy. There is a beach cafe and restaurant. 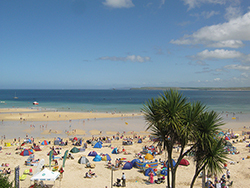 Carbis Bay Railway Station is a short walk from the beach - where you can catch a train back to St Ives.